We want to show how proud we are of our Fourth Graders for finishing your Lenten study of the book of Mark! with a Pizza Party Celebration! All of our Fourth Graders that have completed this book are welcome to join us for a pizza celebration! 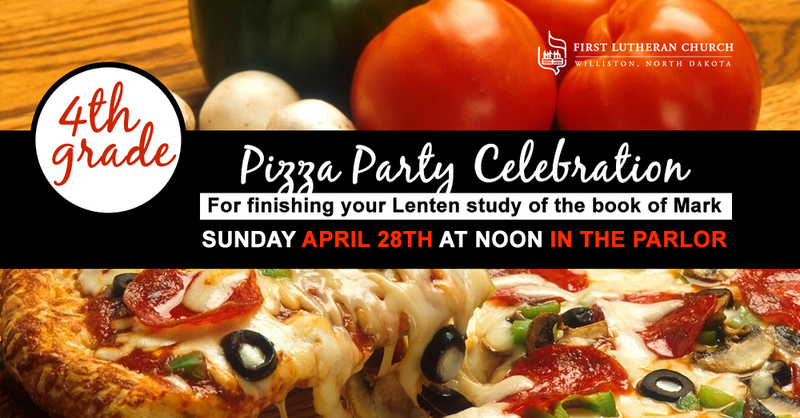 This will take place Sunday April 28th at noon in the Parlor. We’ll see you there! Spend quality time with your baby while helping improve their literacy. All children under the age of 3 years old and their parents are encouraged to join the First Lutheran Church for Baby Book Club. We will read a book together, and then each child will receive a book to take home with them. We hope to see you and your baby there! We will also have a fundraiser for the upcoming 2021 ELCA Youth Gathering to be held in Minneapolis, MN. We'll see you there! Part of the fun of an Easter Egg Hunt is the Easter Egg Dyeing! A fun activity for the entire family! Come over and paint some eggs the way you want to! Easter Egg Dyeing takes place on Sunday, April 14 at 10AM in the Fellowship Hall. The hunt is on, for eggs that is! It’s that time of the year again when we celebrate all things Easter! Join us as we go on a fun Easter Egg hunt for kids Preschool-3rd grade! Bring along the whole family to be a part of the festivities on Sunday, April 21 at 10AM! We’re egg-cited to see you there. The Easter Egg Hunt will be on the second floor of the church. Join First Lutheran Church for Coffee & Conversation! The event will be held on Monday, April 22nd from 2pm - 4pm at Meg-A-Latte Coffee House. Strengthen your faith through discussion and spend time with your peers and friends, all while enjoying delicious beverages from Meg-A-Latte. We look forward to seeing you there! 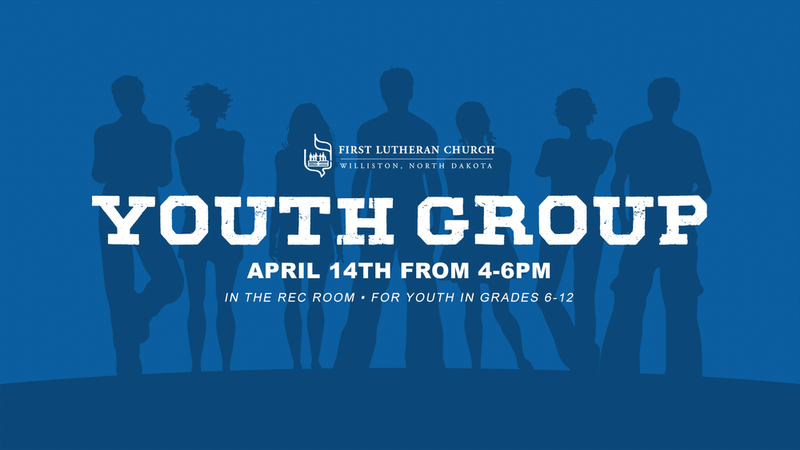 Join First Lutheran Church on April 14th from 4-6pm for our Youth Group. Spend time getting to know your peers and strengthening your faith through engaging activities and discussions! Youth Group will be held in the Youth Room and is open for those in grades 6-12. We look forward to seeing you! 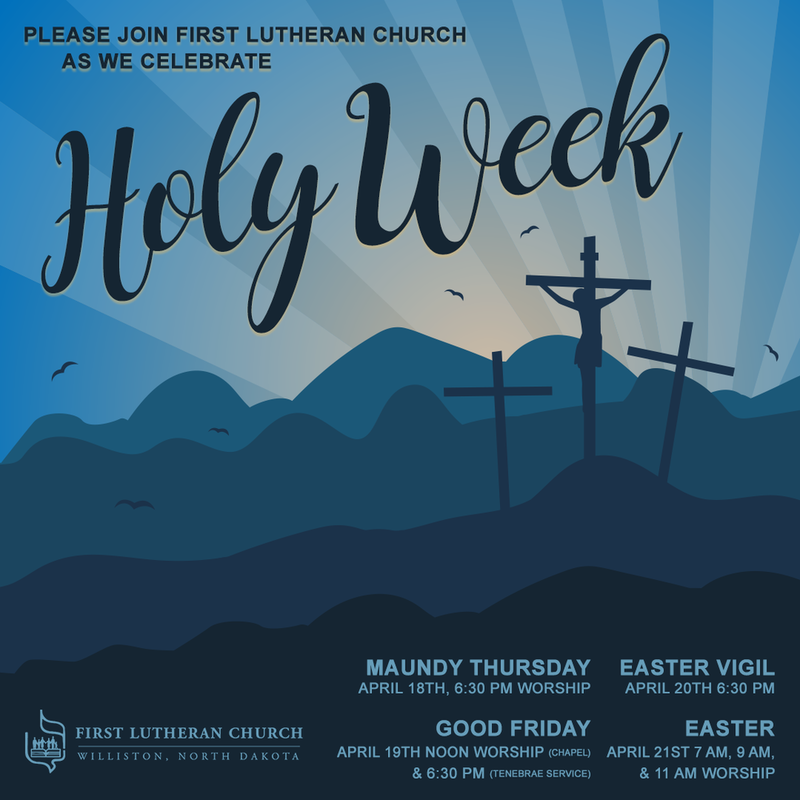 F is for family who do stuff together, U is for you and me, N is for anywhere anytime at all, here at First Lutheran Church! Bring the whole family down to First Lutheran Church on Saturday, March 24th at 10am for a family fun day! We will have games, puzzles, cards, crafts, and much more that will provide tons of fun for all ages. Spend some quality time together as a family, and have an entertaining Saturday! 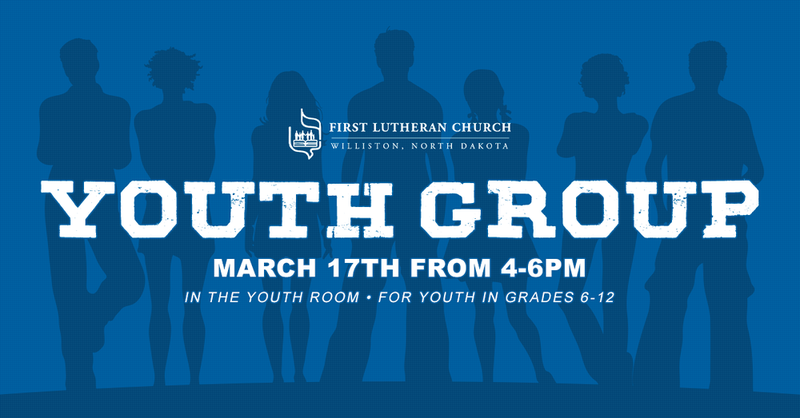 Join First Lutheran Church on March 17th from 4-6pm for our Youth Group. Spend time getting to know your fellow peers and strengthening your faith through engaging activities and discussions! Youth Group will be in the Youth Room and is open for those in grades 6-12. We look forward to seeing you! It’s time for our annual congregational meeting here at First Lutheran! We’re excited to get together and talk about what we want to do for the upcoming year. We’ll see you on February 10, 2019! Adult Choir 2019 Rehearsal Times! CHOIR NEEDS YOU! 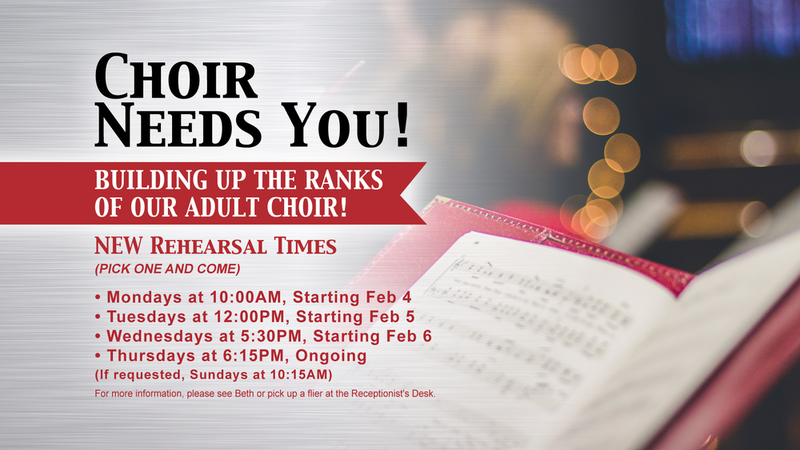 FOR FLC’s Music Ministry, 2019 is about building up the ranks of our Adult Choir. We are experimenting with rehearsal times from February until Easter. NEW Rehearsal Times— PICK ONE & COME! Come to choir rehearsal at a time that works for YOUR schedule...the joys of singing, serving, and, flexibility! Every rehearsal in a given week will cover the same material, our attempt to better respond to you scheduling needs. If you’re interested in finding out more, please see Beth or pick up a flyer at the receptionist’s desk. It’s time to place your bids! 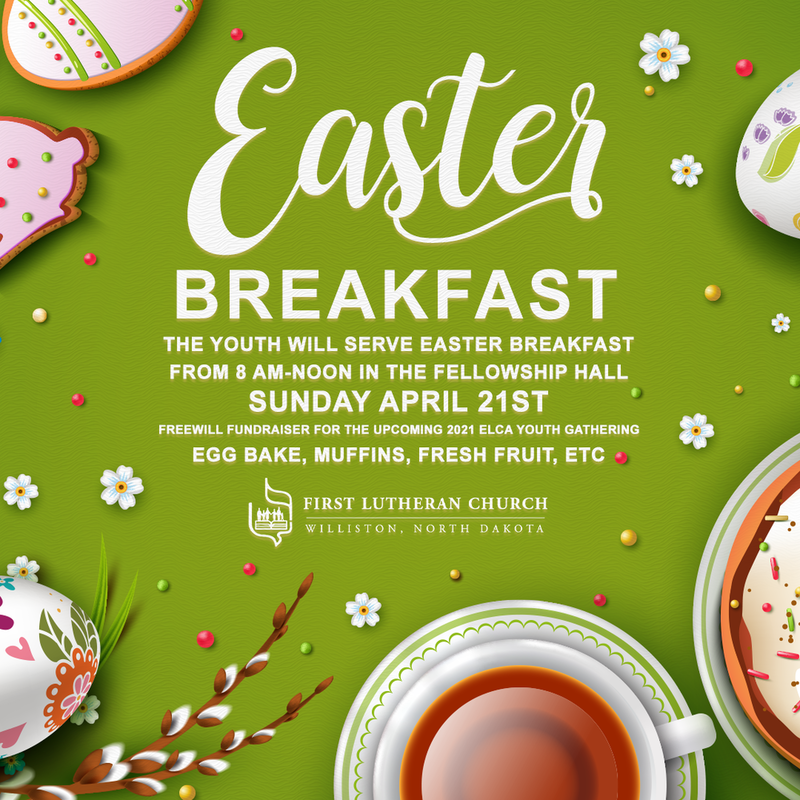 Join the youth group at First Lutheran Church for a fundraiser! We will be hosting a silent auction on Saturday, 23 February from 11 am - 4 pm. Browse the items up for auction, place your bids, and help your fellow youth group raise money for their youth events. Come together for our annual Lutefisk dinner! Join the tradition at First Lutheran Church and enjoy the 86th Annual Lutefisk Dinner! This annual dinner will feature the delicious Lutefisk fish, savory meatballs, potatoes, and our famous rice pudding. Don’t miss out this year, purchase your tickets at our office today! Attention! All young adults from Grades 7-12 are welcome to our Youth Group beginning February 10 from 4-6PM. This will take place in the Youth Room! Come and join in on the fun! Show off your bowling skills at the Strike Zone! 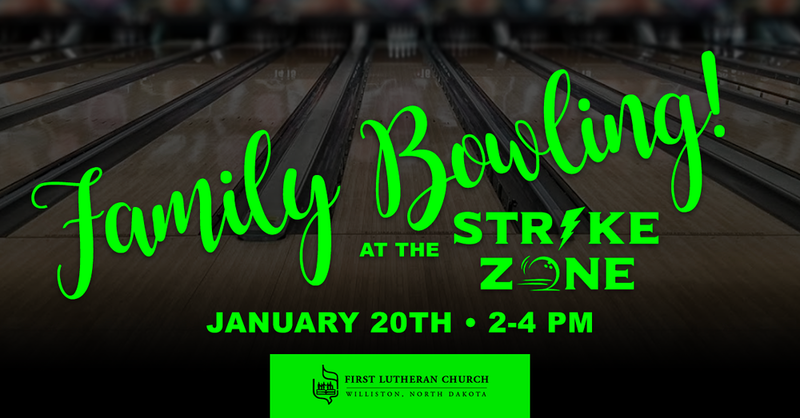 On January 20 from 2 - 4PM, we invite you and your family to come and have some fun bowling! Attention! All young adults from Grades 7-12 are welcome to our Youth Group beginning January 13 from 4-6PM. This will take place in the Youth Room! Come and join in on the fun! Study the the words of the bible at jody Cymbaluk’s House January 6 at 5:30PM. We hope to see you there! On a long winter evening we gather to proclaim the coming of the light. Isaiah announces that the people who walked in darkness have seen a great light. Paul reminds us that the grace of God has appeared, bringing salvation to all. In the familiar account of Christ’s birth, the evening sky is bright with the heavenly host singing, “Glory to God in the highest.” Amid our broken world we proclaim that the Prince of peace is born among us. God comes to us in human flesh—in Christ’s body and blood—so that we may be bearers of divine light to all the world. Our Christmas Eve Candlelight Services will be at 5PM and 9PM on December 24. Our Christmas Day Worship Service will be at 10AM on December 25. Also join us for our Community Christmas Day Dinner from 1PM to 3PM! We will have a variety of different food for all of you to enjoy including Roast Turkey. Come sit by the dinner table with us at First Lutheran and enjoy delicious food with great people! It’s a wonderful holiday tradition! Great food; fine fellowship! Hope to see you there! Join First Lutheran for our annual bake sale! We want to make this one the biggest yet! We will have a variety of snacks and sweets to purchase! This will take place Saturday, December 8! The Bake Sale itself will take place at 2PM. However, at 1PM, please join us for Pie, Rommegrot, and Coffee! They will be served at 1PM. Come by for your Just Desserts!